Spring has officially arrived! For those in the Midwest, the long-awaited time spent outside has arrived with it. It’s during this time the streets and yards will, once again, come to life. There are hamburgers to grill; plants to plant; bikes to ride; and Spring projects to start! Don’t be afraid to make a strong statement. That’s why you’re doing this anyway, right? Your color choice should reflect you and/or your family’s personality. Make sure it blends into and compliments the overall exterior color (you don’t want to be that house). If you don’t know where to begin, we’ve laid out some suggestions from Sherwin-Williams top sought after paint colors for front doors. 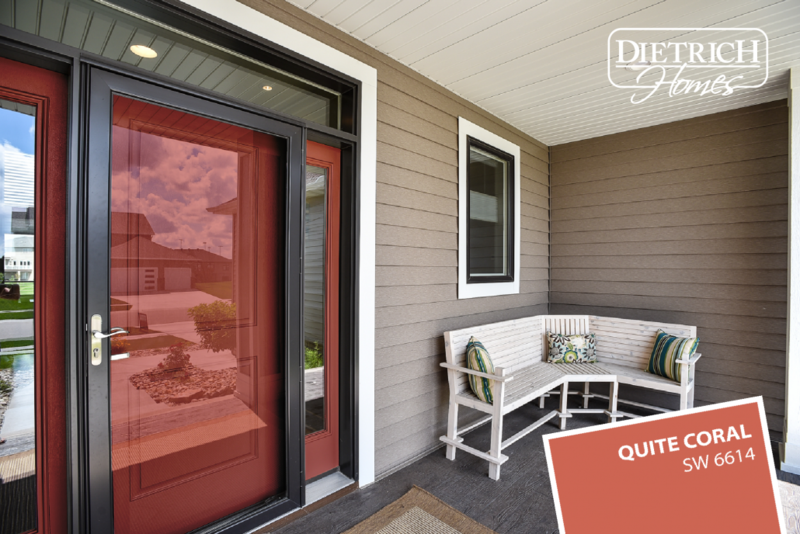 We’ve taken each of the 5 colors and applied them to the doors of Dietrich Homes’ project (it’s for sale, too!) at 3710 6th Street East in Fargo, N.D. It’s immediately easy to see the wild difference the simple pop of color can bring to your home. Consider this color if your home’s exterior had symmetry at its forefront. Symmetrical homes often create a sense of formality, elegance, and tradition. Adding Scherwin-Williams Billowy Breeze to your front door can spotlight the architecture and ensure the siding doesn’t completely fade into its surroundings.evoke a sense of formality, elegance, and heritage. This blue door spotlights the architecture so the siding doesn’t completely fade into its surroundings. Give it the Green Light! If we look to the traditions of Feng Shui teachings, “you can’t go wrong with green!” Green represents the color of balance and renewal. 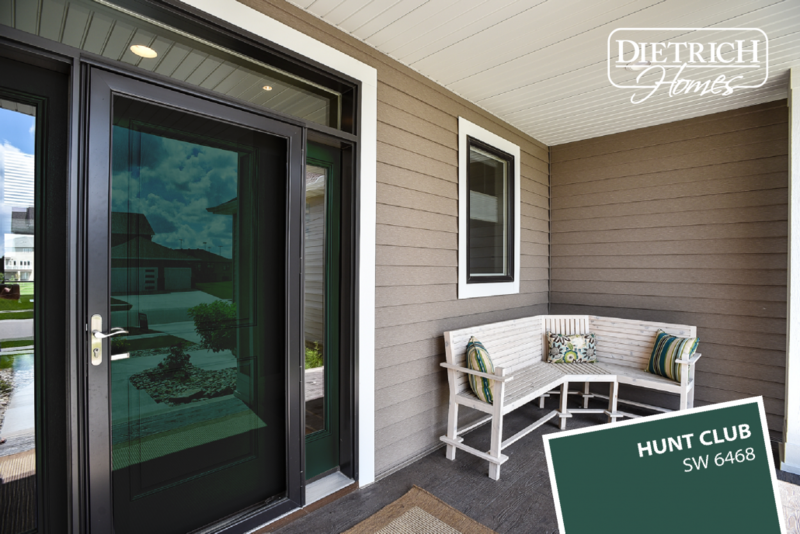 Consider a strong, classical green color like Sherwin-Williams’ Hunt Club. Don’t worry about it blending with your landscaping – using this shade of green will draw out the different shades of green found naturally in your yard. We know what you’re thinking: “Coral pink? Yeah right, that’s too unique!” If your home’s exterior features pale cream, brown, or gray colors, you might want to reconsider. Sherwin-Williams’ Quite Coral might be the companion your cream-colored exterior has been searching for. Pistachios aren’t only for cracking on the summer deck, they can also be used to create one delicious front door. 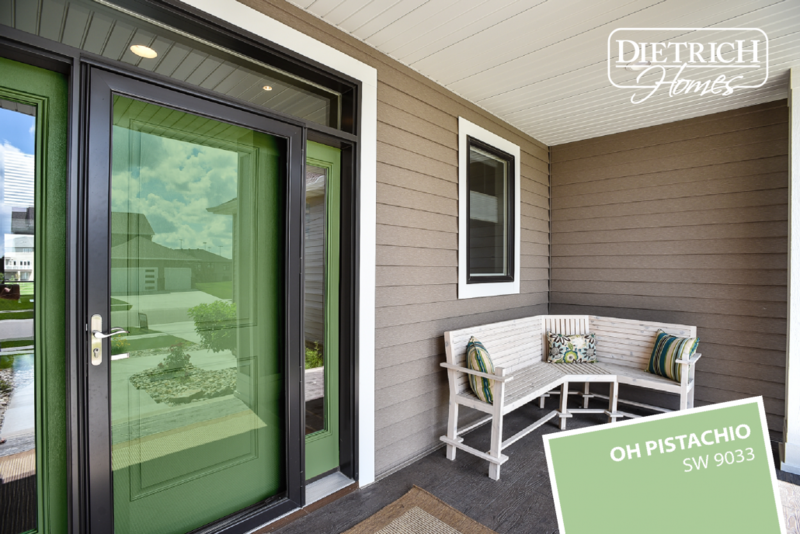 Sherwin-Williams’ Oh Pistachio will give your home a contemporary and vibrant color. This one might have to be just right for you, but the results can be stunning. Consider using Sherwin-Williams’ Fabulous Grape if your home, naturally, has decor like pillows, planters, trim work, or yard ornaments in similar shades. The deep-purple will bring out that decor and give your home the personality and character it deserves. For added character and personality, consider matching your garage doors to your bold and fresh front door!